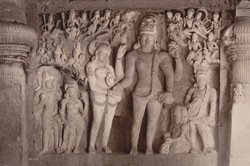 Photograph of a sculptured panel of the marriage of Shiva and Parvati in the Dhumar Lena cave at Ellora from the Curzon Collection: 'Views of Caves of Ellora and Dowlatabad Fort in H.H. the Nizam's Dominions', taken by Deen Dayal in the 1890s. The spectacular site of Ellora, in Maharashtra, is famous for its series of Buddhist, Hindu and Jain cave temples excavated into the rocky façade of a cliff of basalt. The works were done under the patronage of the Kalachuri, the Chalukya and the Rashtrakuta dynasties between the sixth and the ninth centuries. Dhumar Lena is one of the earliest caves of the Hindu series and dates from the Kalachuri period, sixth century, as denoted by the similarity between its columns and those at the Elephanta cave. Large-scale sculpted wall panels on the sides represent Shaivite myths. The sculpture in this view depicts the marriage of Shiva and Parvati. Shiva is holding the hand of Parvati. Brahma, the priest, is seated on the floor making offerings into the fire. In the upper part of the panel there are semi-divine and divine flying figures.